The online version of this article ( https://doi.org/10.1186/s13287-018-0998-7) contains supplementary material, which is available to authorized users. Gene therapy is a revolutionary way to treat the causes of diseases at the gene level. In addition, it is possible to achieve long-term expression in vivo, and genetic information mutated by genetic recombination can be corrected. Many studies have focused on gene delivery as a promising tool to treat diseases at the genetic level [1, 2]. Genes encoding transcription factors, which regulate signaling pathways related to cell proliferation, growth, differentiation, and death, have been the focus of great interest [3, 4, 5, 6]. The internalization of genes encoding transcription factors related to stem cell differentiation has been extensively studied [7, 8, 9, 10]. Cells have been transfected with genes encoding specific transcription factors in an attempt to enhance differentiation towards the desired lineage and prevent differentiation towards other lineages [11, 12]. In this regard, we designed and synthesized dexamethasone (DEX)-conjugated polyethyleneimine (PEI), called DEX/PEI, as a gene carrier. 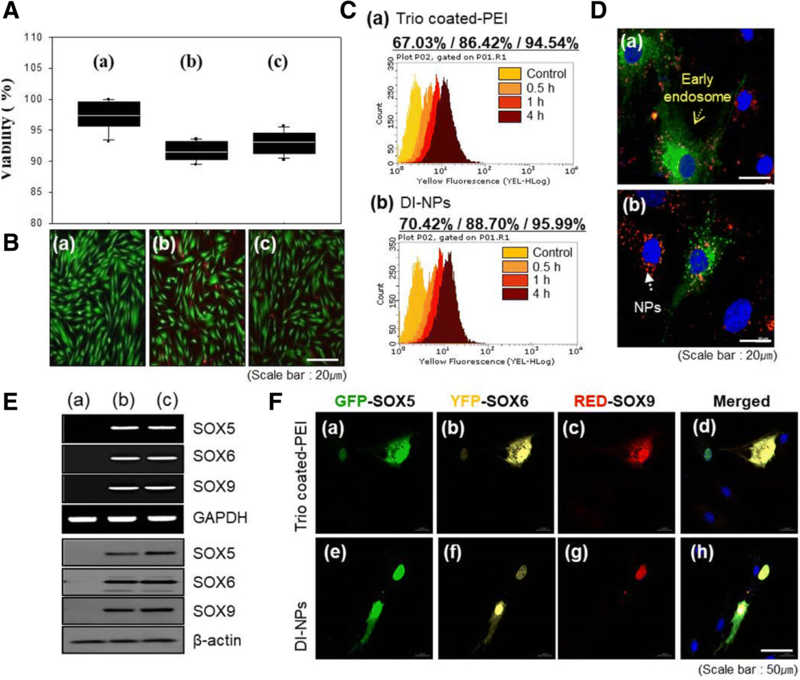 DEX is a synthetic glucocorticoid and therefore binds to the glucocorticoid receptor in the cytosol via the ligand-receptor complex  after transfection of DEX/PEI. The complex is translocated to the nucleus, resulting in enlargement of the nuclear pore; this is helpful for gene delivery. Furthermore, DEX is already known to be an important factor for mesenchymal stem cells leading to osteoblasts, adipocytes, and chondrocytes , and DEX also alleviates inflammation. 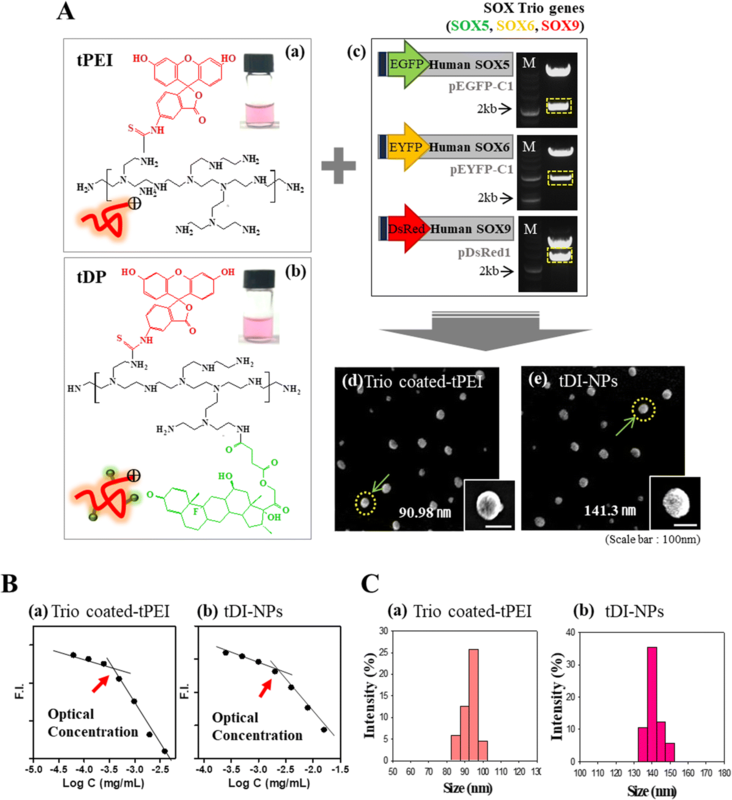 By conjugating DEX to PEI, the efficiency of gene delivery could be improved, facilitating induction of differentiation with low cytotoxicity and low effects of inflammation when applied to an in-vivo study . 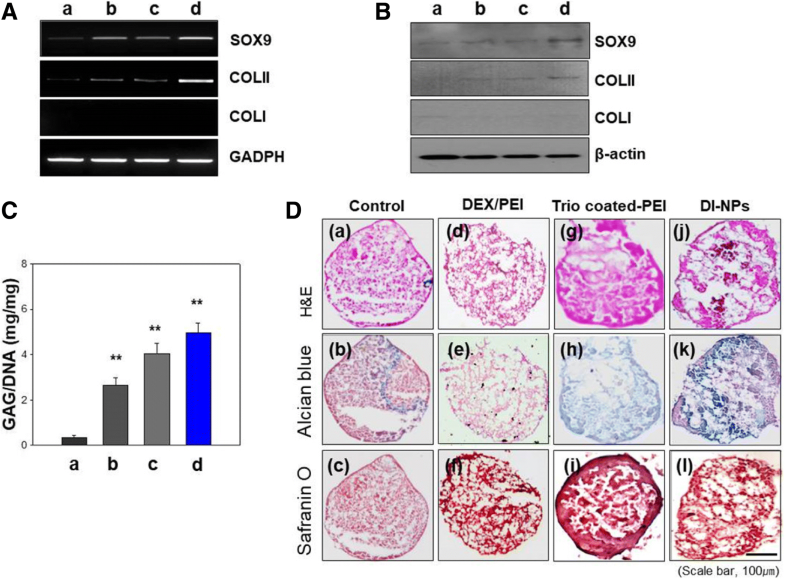 Cationic PEI of DEX/PEI could be easily complexed with anionic plasmid DNA (pDNA) harboring three master chondrogenesis factors: SOX5 (specifically L-SOX5), SOX6, and SOX9 . 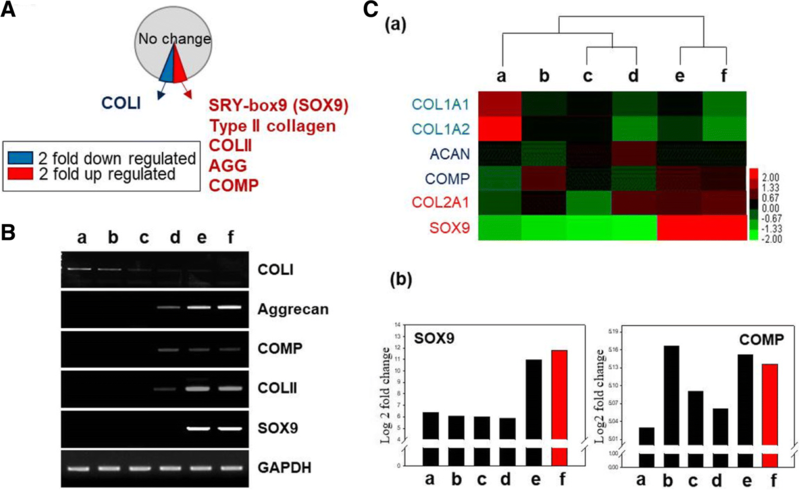 SOX9 is expressed in chondrogenic progenitor cells and mature chondrocytes and induces expression of cartilage-related genes such as collagen type 2 alpha 1 and aggrecan . L-SOX5 and SOX6 are excited at the stage of prechondrocytes in the presence of SOX9 and increase cartilage-specific gene expression together with the existence of SOX9 . 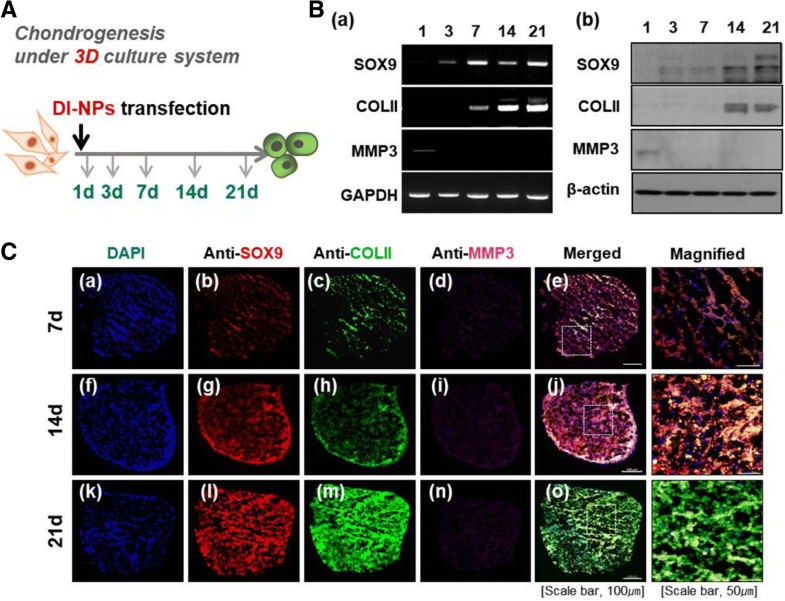 These DEX/PEI complexes with pDNA of SOX5, SOX6, and SOX9 are termed differentiation-inducing nanoparticles (DI-NPs), and DI-NPs could effectively induce chondrogenic differentiation of stem cells. 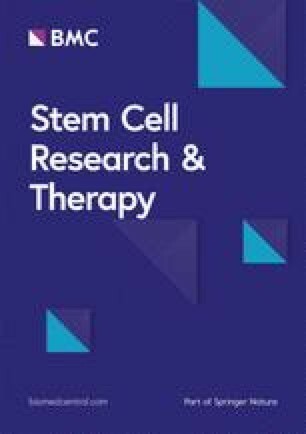 Mesenchymal stem cells (MSCs) are one of the broadly used stem cell types for repairing cartilage defects [19, 20, 21]. 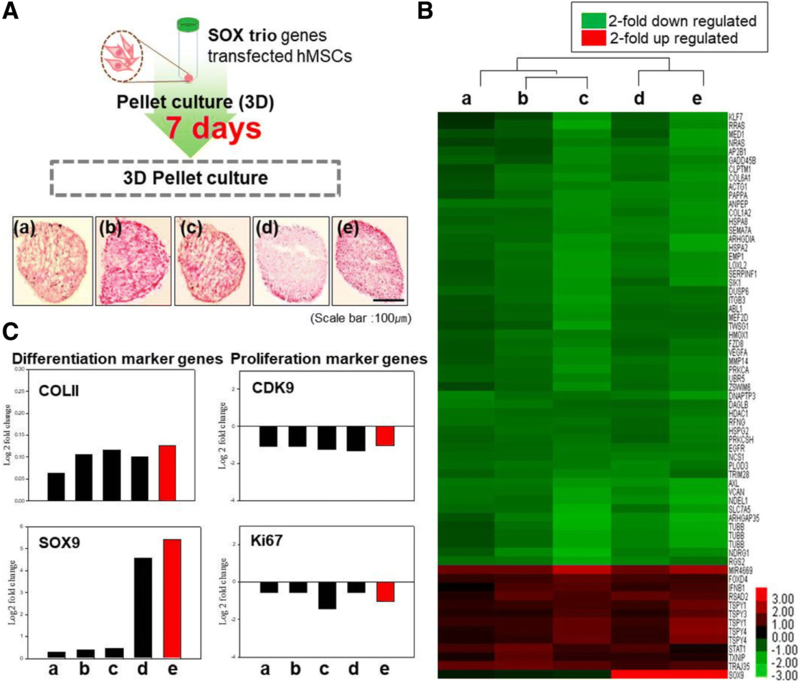 In this study, DI-NPs were applied to MSCs for inducing chondrogenic differentiation. The differentiation of MSCs into chondrocytes has not, however, been overly studied for gene expression profiling using microarray . 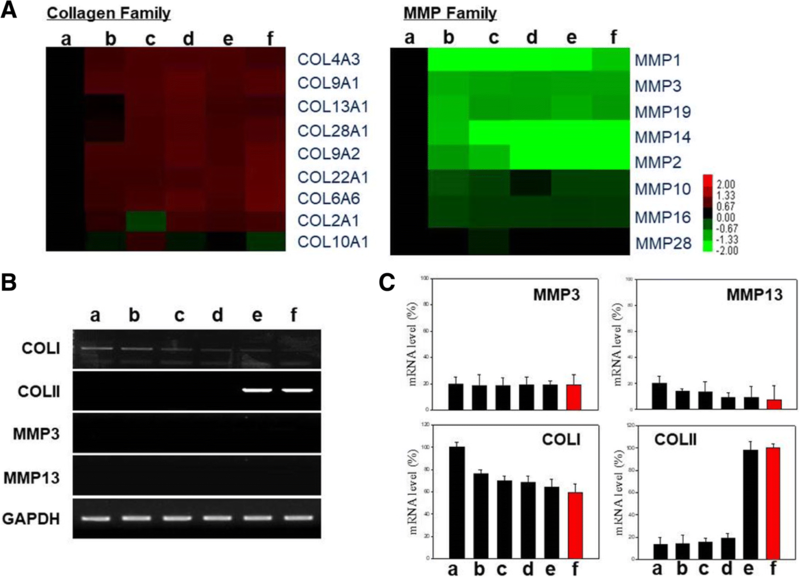 Through gene expression profiling, it is possible to measure and compare the expression level of mRNAs in differentiation-induced cells and noninduced cells. This allows the identification of genes that are overexpressed or underexpressed in differentiation-induced cells. The expression profile may provide information regarding the level of differentiation of an induced model by a particular tool [23, 24]. Gene expression profiling using microarrays is a major tool for the measurement of levels and patterns of gene expression. It can be used to identify diseases and uncover treatments in clinical medicine. 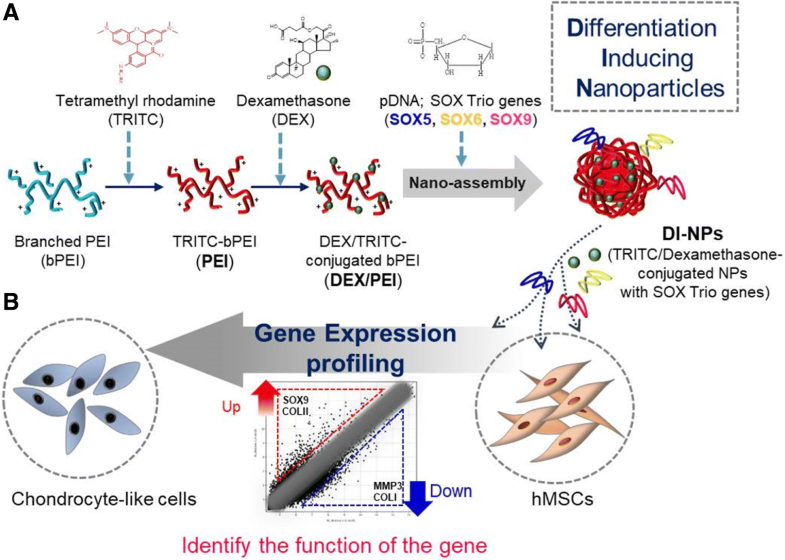 Moreover, analyses of gene expression can be clinically useful for therapeutic application of stem cells toward the treatment of diseases related to cartilage defects.